The multi-functional room; they have been popular for a long time, accommodating everyone who walks in them. They don’t seem to be going anywhere fast either. However, once we have opened up our homes from many small rooms to one big one, this causes its own problems. One room zoned into specific areas for cooking, dining and relaxing appears to be a dream, but is the reality somewhat different? Together with Harvey Jones, fitters of bespoke fitted kitchens, we take a look at this new kitchen trend. When leading a sociable lifestyle, entertaining guests can be difficult in a cramped space. This is why open-plan spaces can seem like such a convenient solution. 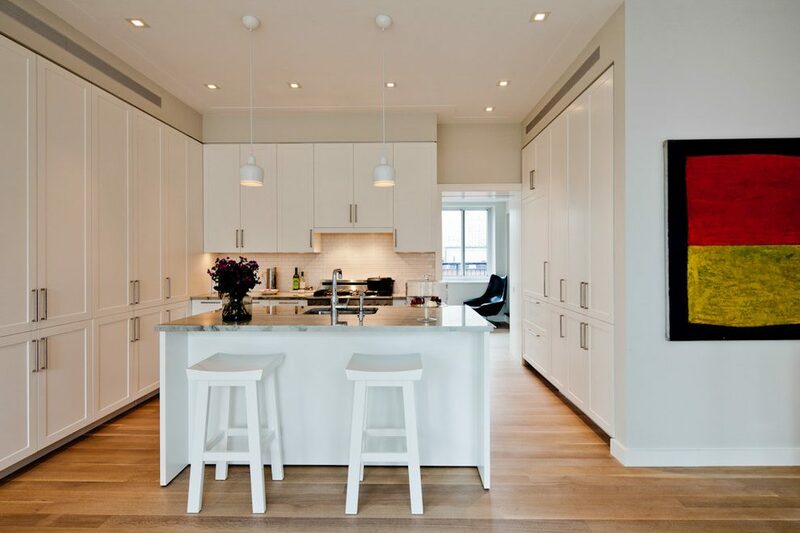 For multi-functional rooms that include a kitchen, the benefits are clear. It prevents the cook from feeling isolated for a start. No more retiring to the kitchen for half an hour on your own to prepare meals. A bespoke kitchen scheme that includes an island or peninsula that looks out onto the rest of the space means that cooking and preparing food need no longer be a solitary process. Often also given as a reason for going open plan is the need to keep an eye on children. From toddlers playing to teens doing their homework, for busy families a space that performs several functions allows the family to spend time together even when they’re performing many different tasks. House sizes are decreasing year on year, and that’s why an open-plan kitchen/diner can seem like a good alternative to a separate dining room that may take up too much space. However, a kitchen diner can be a good way of maximising space and design. However, you do have to be canny when planning a multi-functional room to ensure all zones work well together and recognize that this kind of layout will reduce privacy, particularly if you’re opening up the whole of your downstairs. Having nowhere quiet to retire while the kids watch TV or play can become a problem. There are also the issues of noise from appliances that might disturb you or that clearly evident pile of washing-up nagging at you as you sit down for an evening of TV or a quiet read with your favourite book or magazine. Fewer walls also mean less space to put furniture, which can lead to a room that’s crammed around the walls or jumbled in the centre. As a new trend for 2017, broken-plan living can set the new precedent in interior design trends, replacing open plan in the future. The idea is to retain all the things you love about open-plan – particularly the light and openness – while at the same time zoning the space to allow for more privacy should you need it. Rather than doing this with colours and textures as you would in a true open-plan arrangements, broken-plan employs structural elements such as half-walls, dividing shelves, changing levels, walls of glass and even mezzanines to delineate and formalise areas for different uses. How does this trend look? By cordoning off certain areas to create new spaces, ‘walls’ can be created by using boxed shelving and other furniture to define spaces that weren’t previously there in the room. Of course, you don’t want to regress back to small poky rooms, so don’t cram the shelves full of books – instead, artfully arrange a few favourite pieces to signal the change between one room and another and leave some of the shelves open to allow light to freely cascade from one zone to another. If you’re just starting your project, consider just knocking down half a wall and leaving the top open, allowing sight-lines through but at the same time giving you more wall space to play with. While hatches should remain a distinctly 70s invention, a larger aperture in the wall between a kitchen and sitting room, for example, is a workable and modern substitute. Although you can use furniture to cordon off various parts of the room, this should be done sparingly and subtly. Also, consider building in pocket doors that will slide out of sight into the walls when you want to join two rooms but can be closed quickly to create separation when needed. As well as this trend, Crittall-style windows have also become a popular interior design trend. Metal framed windows and sometimes doors traditionally used in industrial spaces or as exterior walls onto gardens have celebrity fans such as TV presenter and architect George Clarke, who celebrates their ability to cleverly divide an internal space without shutting off one room totally from another. Broken-plan spaces can accommodate changing floor and ceiling heights – helping to bring spaces together that usually wouldn’t work as an open plan space. With broken-plan living, the options are unlimited when it comes to your interior design space.